Add color to your bathroom. Today homeowners can add a boldness to their powder room décor by adding bathroom fixtures in colors from a wide palette of choices. If you're like most people, your bathroom is the one room you haven't changed as long as you have owned your house. Rooms like the kitchen and living room clamor for our renovating attention, leaving the bathroom last on the list to be upgraded. But when the time comes to modernize your bathroom's décor, plan to do it right. Don't just repaint the walls with a new color. Think of going all they way. 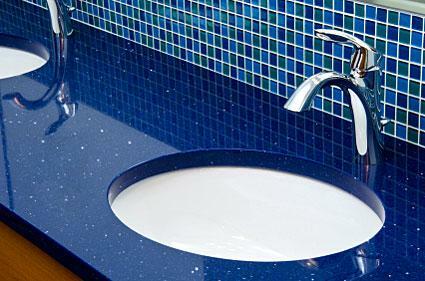 Plan to replace your outdated sink, vanity, tub and toilet. 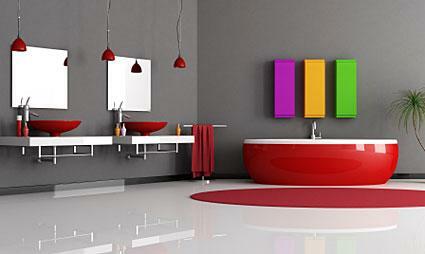 With today's selection you can install bathroom fixtures in colors to fit any decorating theme. I remember back in the '50s my girl friend's house had a black tub, toilet and sink with pink tiles decorating the walls. Today, with a little work that retro look would be very marketable. If you've neglected your bathroom for years or purchased an older home with outdated fixtures, you may want to shop around to check out the latest in bathroom design. With the numerous styles and designs on the market today, your bathroom renovation project can incorporate a cutting edge look, and if you do your homework you can do it for a reasonable price. Check prices at your local home improvement stores and compare them with prices available through online renovation retailers specializing in bathroom fixtures. For quite a few years now, the trend in bathroom décor has stayed with popular neutrals like creams and taupes. The logic behind these choices is that they are safe because they go with any color scheme. But if you're tired of playing it safe and are ready to go bolder, a selection of bathroom fixtures in colors for every taste offers a whole new pallet to choose from. Today's choices, which are most often associated with contemporary designs, can also compliment traditional preferences. Take the time to measure and write down the dimensions. Carry dimensions with you to have them handy when you shop. Carry a swash of the bathroom color. Another thing to consider if you have a very small bathroom is the elimination of the vanity to provide more room. Installing a pedestal sink or a wall mount sink as an alternate will help your small room look bigger. Whether you're remodeling or putting in a new bathroom, choose fixtures that create the look and functionality that make your bathroom an extension of your home décor. Colorful bathroom fixtures can make this project creative and fun, but remember to keep it practical and functional as well because bathrooms are well-used and part of your everyday routine.